Sakai Hiroyuki is one of Japan's most famous, iconic French chefs, having led and inspired many of the country's brightest culinary artists throughout his career. Yet his greatest claim to fame might be his appearance on Iron Chef, the TV show where he served as the second (and final) Iron Chef French—despite having never been formally trained in France. In 1994, after persistent persuasion from Fuji TV, Sakai agreed to compete on Iron Chef, but only for a few months. He ended his run on the show six years later. Sakai was born in 1942 into a family whose father fought in World War II and never returned. He endured Japan's postwar food shortages, eating a lot of sweet potatoes and squash. To this day, Sakai prefers not to use these ingredients, since they remind him of his poor, hungry childhood. At sixteen, he left home to pursue his dream of becoming a chef on a cruise ship. Early in his career, he worked at a restaurant during the day and went to culinary school in Osaka at night. It was around this time that he saw a job posting for a French restaurant at a hotel in Australia, and he jumped at the chance. Sakai longed to work abroad, even though—as he has joked—no one would have picked Australia as an ideal place to study French cuisine. Sakai returned to Japan eighteen months later to work under the man whom he would eventually consider his hero: Shido Fujio, a pioneer of French cuisine in Japan who served as private chef to prime minister Yoshida Shigeru. In 1971, at the age of thirty, Sakai got an offer to open a French restaurant with a kaiseki twist, which was innovative for the time. It came from restaurant owner John Kanaya, who sent him to another kaiseki restaurant to learn kaiseki cuisine. It was Sakai's task to figure out how to marry these very different styles of cooking. At the time, Sakai wasn't content with the position. He envied his colleagues who were studying in France. But thanks to this unique French-plus-kaiseki concept, his new restaurant was a massive success, leading Sakai to become the culinary legend he is today. In 1994, after persistent persuasion from Fuji TV, Sakai agreed to compete on Iron Chef, but only for a few months. He ended his run on the show six years later. While some critics don't consider Sakai's style to be true French cuisine, as Iron Chef fans know, he is a creative, badass chef with no limits to his imagination. Sakai opened La Rochelle in Minami Aoyama in 1999. Named for the picturesque city he visited on his first trip to France, La Rochelle inspired his own dreams of opening his own establishment under its name. 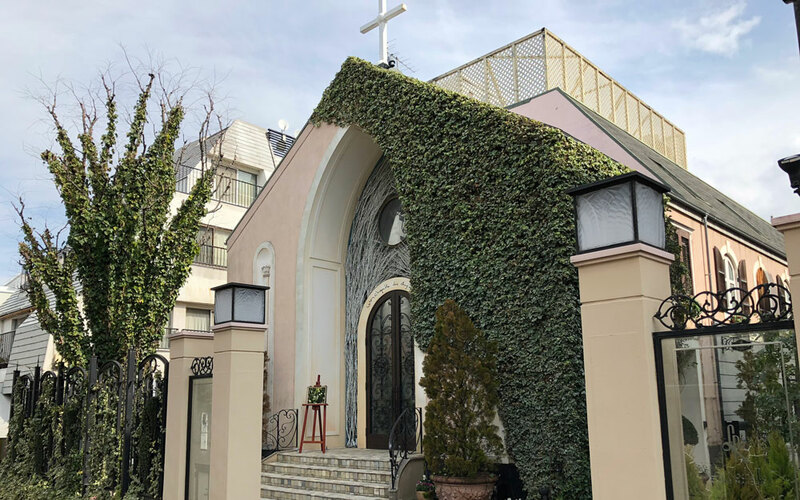 Minami Aoyama is known for high-end dining, fashion boutiques, and art galleries. Even from the outside, La Rochelle is one of the area's more luxurious storefronts. 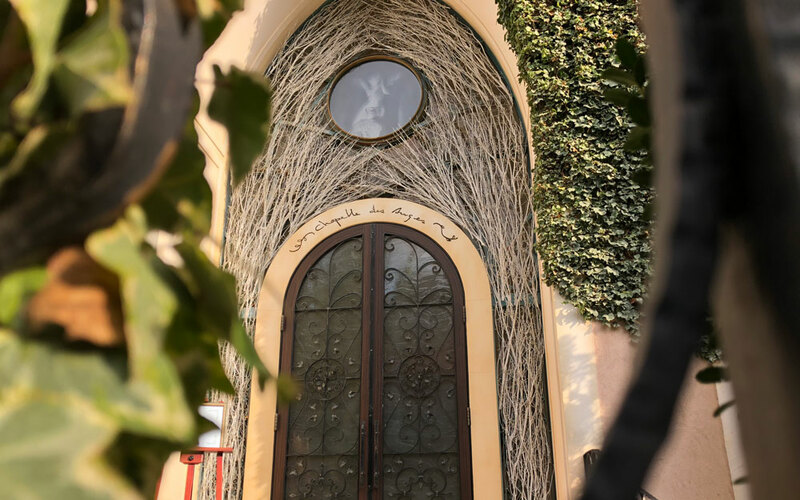 A chapel in front is used as a bridal venue, and the restaurant is tucked in the back. When we opened the door, the staff eagerly greeted and welcomed us in a professional manner. From the start, it was apparent how spacious La Rochelle is, which makes sense considering its second role as wedding reception venue. The day we went, a large party had reserved the main space, and smaller parties like ours were guided to another space separated with a partition so we could have a relaxing meal away from the party. I thought this was very considerate. 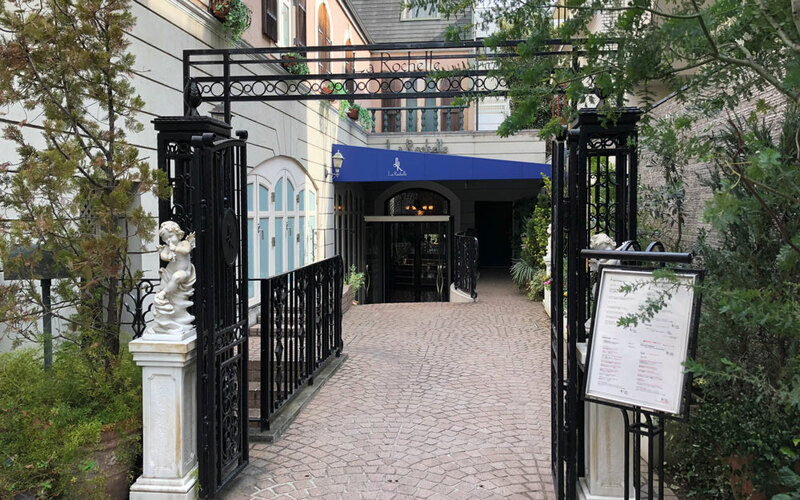 La Rochelle has an elegant yet lively atmosphere, with bright white tablecloths and napkins, gleaming silverware, and European décor. The sounds of utensils clinking against plates and guests chatting and enjoying their meals floated around us. We visited La Rochelle for its lunch course. For me, it was my own dream come true: back in college, my classmates and I were French literature students well aware of the restaurant's reputation, so it felt exciting to be sitting down to finally enjoy a meal here. And enjoy it we did. To stimulate our appetites, we were first presented with a trio of bite-sized appetizers made from jinenjo, a type of Japanese mountain yam, cooked three different ways. Truth be told, it didn't feel very French; it felt Japanese—which wasn't a bad thing. Compared with other mountain yams, jinenjo is a much-sought-after ingredient, sticky with a strong flavor. On the plate were three versions of it: a noodle soup made with thinly-sliced jinenjo, a deep-fried jinenjo skewer covered in green seaweed powder, and a jinenjo cake topped with ham. The soup tasted similar to soba broth with the addition of dashi and soy sauce. Soba broth and tororo (sticky ground yam) are a common combination in Japan, but substituting raw, sliced jinenjo for the noodles improved it by adding crisp texture to the stickiness. Truth be told, it didn't feel very French; it felt Japanese—which wasn't a bad thing. Thickened by the sticky jinenjo noodles, the soup was so delicious that we enjoyed it down to the final sip. We agreed that the dish was reminiscent of Sakai's performance on Iron Chef, where he often boldly applied bonito flakes or kelp to his broth. Next, the deep-fried jinenjo skewer was a good textural contrast to the noodle dish. Breaded with crumbles, it was crispy outside and fluffy inside, a totally new texture in contrast to traditionally cooked yams. Seasoning it with aonori (powdered seaweed) gave it perfect saltiness and flavor. The last bite, the jinenjo cake, revealed joyfully springy dough. I'd never considered the flavor combination of ham and jinenjo, but they tasted great together. 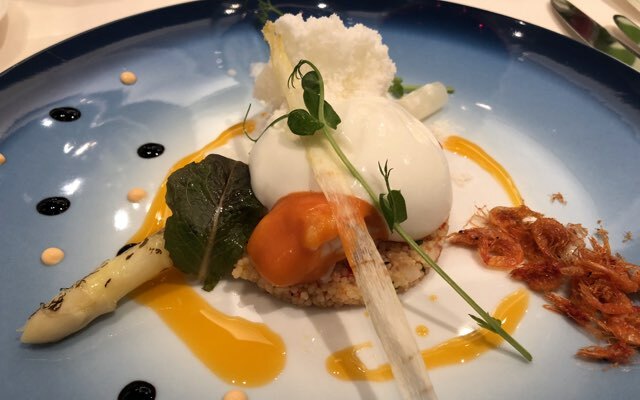 After this amuse-bouche, we were served what La Rochelle called "Iwate white asparagus and ensemble of freshwater prawn and shiba shrimp." 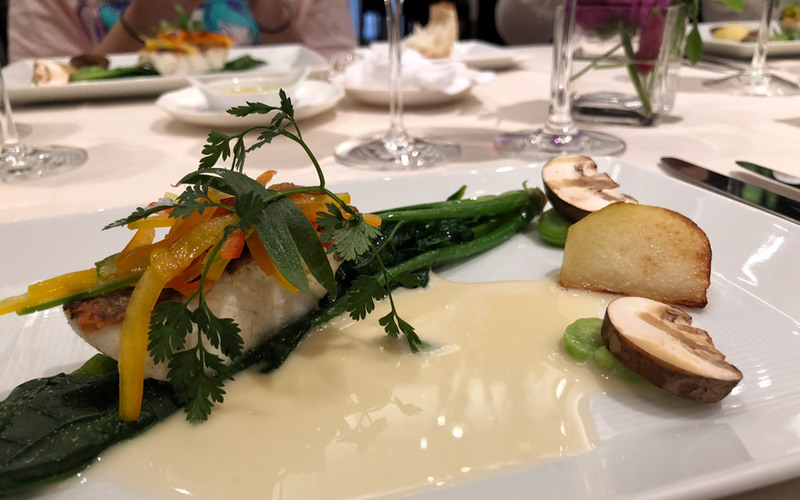 While the main ingredients of this gorgeous second course are classics of French cuisine, the white asparagus, grown in Iwate prefecture and harvested in early spring, sounded special. Later I learned that these asparagus are called 白い果実 (white fruits) due to their sweet juiciness. Here, the "white fruits" were turned into a beautiful, creamy sorbet, served with additional grilled and fried asparagus spears. This sat upon couscous that was well-seasoned with powdered shrimp, freshwater prawn sauce, dried shiba shrimp, and a few drops of balsamic vinegar that kept its flavor exciting. I liked the diversity of textures, especially the creamy white asparagus sorbet that melted in my mouth. Next up was La Rochelle's "fish of the day:" blackfin seabass poêlé (pan-fried). Here the restaurant revealed the DNA of Iron Chef Sakai, who rarely lost battles involving fish. The poêlé and its sauce were perfectly on point. 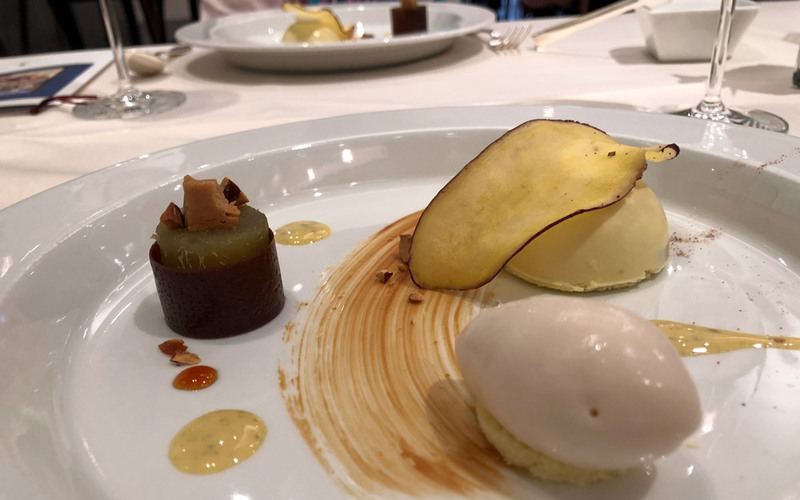 With Noilly Prat vermouth adding a complex herbal flavor to the cream, the dish itself was nothing gimmicky. Simple in comparison to other courses, it was cooked and seasoned perfectly. The Japanese have a saying—デザートは別腹 ("Another stomach for desserts! ")—which echoes the French: "Il y a toujours de la place pour le dessert ("There's always room for dessert!"). 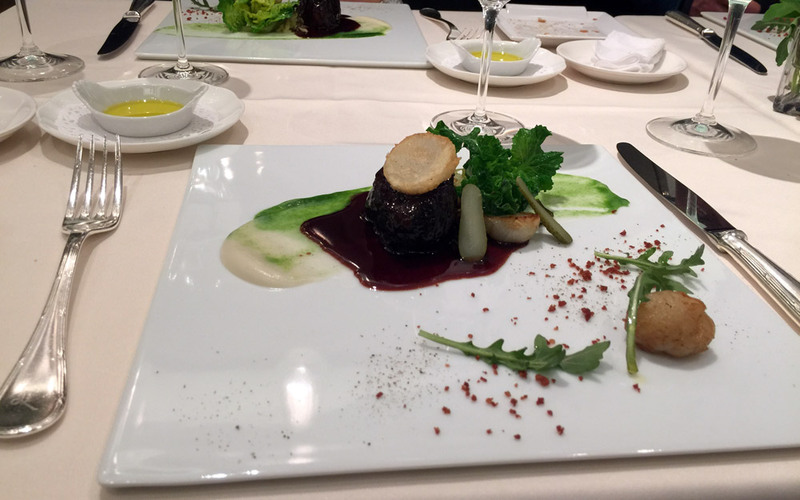 When I first saw "red wine braised wagyu cheek" on the menu, I was excited, to say the least. Yet the wagyu cheek ended up being my least favorite of the lunch. My expectations were probably too high, as I had imagined tender beef cheek with a rich flavor. But all of us agreed that this wasn't the greatest beef dish we'd ever eaten. To start with, the beef was under-seasoned—it made me wish I could add some salt. The texture was disappointing, too, and definitely not as soft as I had hoped. Luckily, everything else on the plate—the potatoes, bacon bits, and onions—were great. I only wish the meat had been cooked and seasoned differently, especially since it's hard to find good wagyu in the US, especially the cheek. At La Rochelle, we ordered several. The first arrived tucked inside a sakemasu embossed with the restaurant's logo. Within was a scoop of yellow turnip ice cream with yuzu sorbet, pineapple, and kiwi. 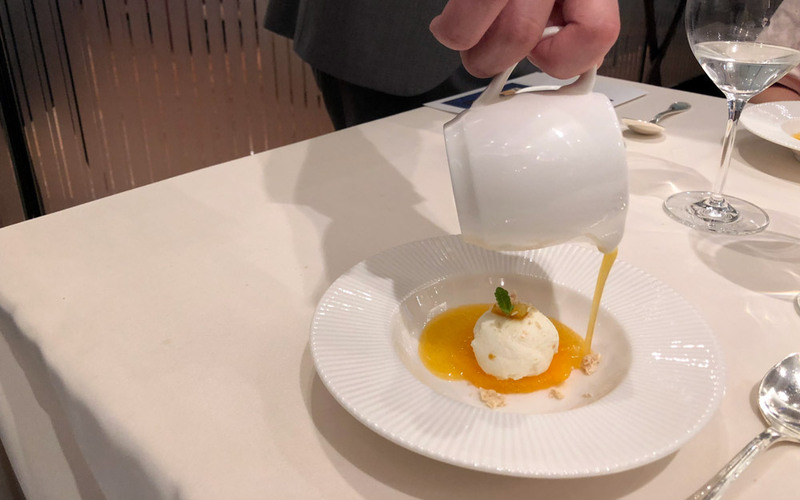 Revealing a natural, modest sweetness that came from the turnip, this ice cream was light and not too sweet, bridging the gap between our previous courses and dessert. As a fan of vegetable-flavored ice cream, this suited my palate nicely. The yuzu sorbet and tropical fruits underneath were refreshing too. Mostly, it prepared us for what was to come. 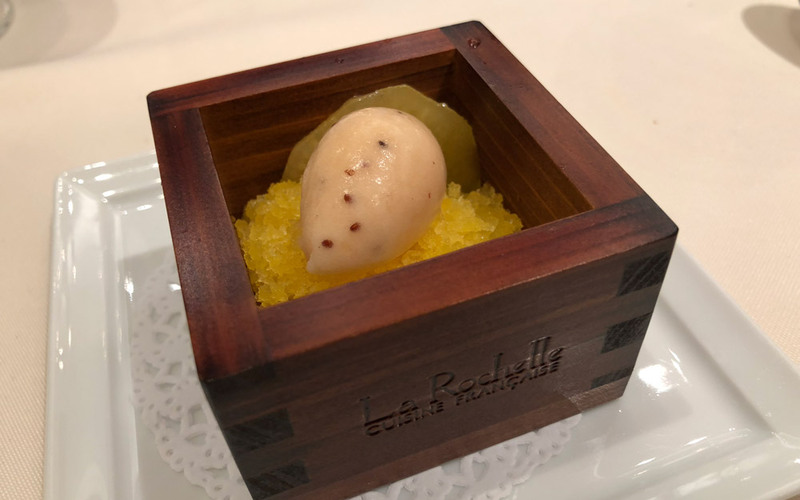 "Dessert of beniharuka sweet potato with white pea sorbet." Our second dessert was beniharuka with white pea sorbet. Beniharuka is sweet potato, newly developed in Kyushu in 2007, with an improved taste and skin color. This being February, it was at the end of its season, and we were lucky to be able to taste it. The beniharuka, too, was presented three ways. In the image above, the sweet potato in the top left was similar to kanro-ni: sweetened and boiled, then wrapped in dark chocolate and topped with crunchy nuts and caramel. On the top right was pea sorbet, coated in a white chocolate dome and topped with dried beniharuka. At the bottom right, a simple sponge cake was served with beniharuka ice cream. I would give 💯 to every item on the plate, since I actually love all vegetable-flavored desserts. Because of its sweetness, beniharuka is popular when it's baked, and my only wish was that I could have tasted it by itself. The finale of our feast was "mousse with dekopon jelly." Contrary to how it sounds, Dekopon is not a Pokémon, but instead a kind of citrus that's similar to orange but very sweet. We were first served a plate with fluffy mousse, over which our garçon poured fluid jelly made with dekopon. The combination of cream and bittersweet orange is another favorite of mine, reminding me of the orange Bavarian cream my mom used to make, the orange fluff salad my Southern in-laws cook, or even FAGE yogurt with orange sauce. These probably aren't accurate comparisons to a dessert served in a fancy restaurant, but the dish's flavors brought those things to mind. It was creamy orange perfection, the fresh mint on the top completing the whole course beautifully. We had a delicious, satisfying lunch at La Rochelle. Overall, I liked how the kitchen created a variety of textures from the same ingredients. At kaiseki restaurants, I can get overwhelmed by the complexity of flavors coming from so many ingredients—many of them overused. La Rochelle carefully picks the season's best ingredients, making the most of them while contrasting them with different textures. The only negative I found was the under-seasoned beef—otherwise, it was an amazing lunch course. Food aside, the atmosphere at La Rochelle was welcoming and pleasant. Unlike certain edgy, "hip" French restaurants where I tend to feel nervous, here it felt elegant and calming. From the decor to the flamboyant choice of plates, and even the menu design (Comic Sans font! ), La Rochelle felt approachable and relaxed. The price for lunch wasn't overwhelming, either: ¥6,200 (about $55), including a cup of coffee. At La Rochelle, you can expect a great meal with excellent service. I would definitely return, next time with hopes of meeting the great Iron Chef Sakai in person. As for customer service, all the staff were excellent. Iron Chef Sakai's motto is to "work with joy," rather than aim for perfection without any emotional space to enjoy preparing or serving the food to his customers. Besides giving us great service, his staff were truly pleasant. One of our waiters mentioned that Chef Sakai had been at the restaurant the day before, taking pictures with his employees and posting them on Facebook. Sakai always seemed friendly and likable on Iron Chef, and this anecdote about him made perfect sense. Having worked in restaurants myself, I know that Tokyo's food industry can be intense and dehumanizing. Even as a customer, I've felt the tension in certain establishments, despite the staff's smiling faces. At La Rochelle, however, everyone seemed to genuinely enjoy serving us, and it made me happy. I think La Rochelle is a great option for those times you feel like giving yourself a little treat or for going out for a nice, French course meal. 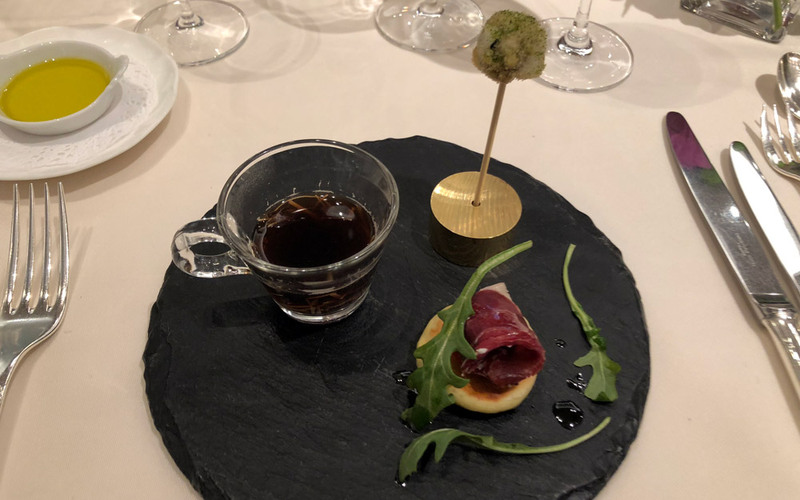 I hate myself for not being able to forget that the wagyu dish was not executed in the way we expected that day, but I can’t help but always remember that. But overall, I enjoyed the meal and atmosphere. I would be open to going back (probably, for lunch again) and hopefully there won’t be any major disappointments like that next time. I came to see if Sakai still uses the ring mold. Food was delicious and service was great—what you would expect from an upscale establishment. And yes, one of his dishes did use a ring mold. La Rochelle left a good impression on me. From the delicious food to the kind staff, it was a great experience. 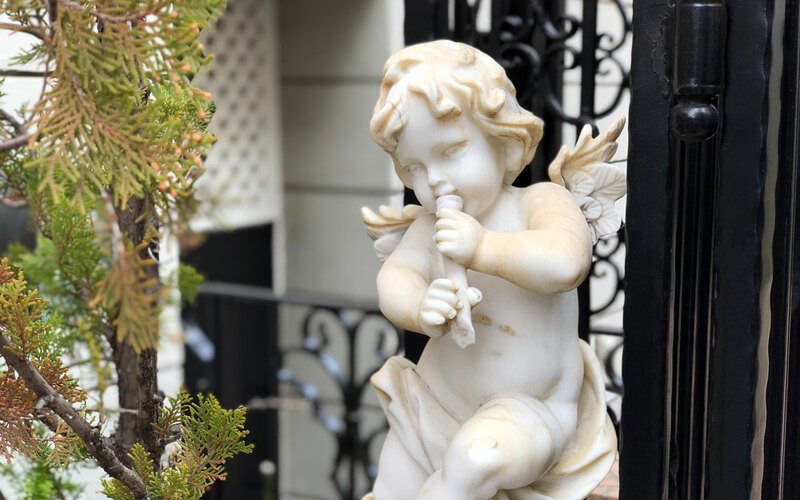 The place was beautiful and spacious, but it didn’t feel stuffy—it made me feel at ease. It would be nice to visit again! La Rochelle, like most of the Iron Chef restaurants, was good. The atmosphere was nice, the servers were knowledgeable and kind, and we didn’t leave overly full––something American “fancy” restaurants could learn a thing or two about. It wasn’t the best Iron Chef restaurant we went to, but it was still better than the average restaurant by a mile. If you like French food, I don’t think you’ll be disappointed.